In fashion illustration, a few good lines can go a long way toward creating a dynamic torso. However, consider what you can do with just one good line. Try drawing the torso with flair by using a technique called gesture drawing, the art of drawing quickly to capture the essence of something rather than to immortalize every detail. So you draw the torso (and eventually the fashion figure) using only one line, not ever lifting the pencil from the paper. Because gesture drawing includes only the essential elements, it gives more of a sense of motion. It forces the artist to loosen up and gives the drawing an organic look. 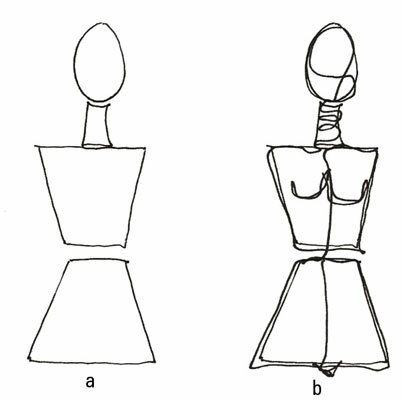 It leads to a more fluid line, which is critical in fashion illustration. You can use it for getting an idea down on paper and refine it later. You must draw quickly when doing gesture drawing. Don’t overthink it! Otherwise, you lose the organic feel of the drawing. Getting out of the habit of erasing every little line that’s out of place takes patience and practice, so stick with it. Start with your basic trapezoids and an oval to create a torso and head. Put your pencil at any point on a trapezoid. Without lifting your pencil point from the paper, draw a line moving any direction that outlines the body and head. Overlapping lines is okay. The next time you do this exercise, skip Step 1 and start gesture drawing the body with a single line. It sounds tough, but after you try your hand at gesture drawing a few times, you’ll love the results. Remember that gesture drawing isn’t governed by any exact rules — just go with the flow!